Upon consultation we have a variety of products available to buy to help with the health of your hair and scalp. Clinically supported unique formula to help maximise hair growth. Chronic Telogen Effluvium (CTE) is the term used to describe excessive and persistent hair shedding. Research has shown that currently up to 33% report having less hair than 5 years ago, this amounts to a staggering 4.8 million women in the UK. Florisene® is a clinically supported supplementation programme shown to help women with CTE. Research involving hundreds of women has shown that the major cause of CTE is low serum ferritin. This reflects the amount of ‘stored’ iron in the body. For some women, low ferritin levels results in gradual hair loss, the end result to the sufferer being a ‘thinner’ ponytail or less hair to clip back. Low serum ferritin in women is now common due to reduced red meat consumption and menstrual blood loss in women of reproductive age. The good news is that research has shown that if the serum ferritin is raised above a certain point then normal hair growth re-establishes. This does not necessarily show up as anaemia and so CTE may occur with no other clinical signs or symptoms aside from hair shedding. Florisene® is a clinically-relevant iron supplementation programme, consisting of a highly absorbable form of iron and a significant level of the essential amino acid L-Lysine, plus 2 other known iron-synergists, vitamin C and vitamin B12, plus biotin and selenium. Research indicates that low L-Lysine intakes may exacerbate a reduced ferritin level and clinical studies show that for some women ferritin levels will not improve without supplementary L-Lysine. Take1-3 tablets daily for the first six months. Thereafter for maintenance purposes take 1 to 2 tablets daily. However for those who have heavy periods or who eat little or no red meat then 2 tablets may be required. Florisene ® should be taken with water half to one hour before food or on an empty stomach. Use in pregnancy during breastfeeding or if planning to become pregnant: Consult a doctor before taking Florisene®. Florisene® should not be taken within 2 hours of taking any medication including indigestion remedies. Florisene® is safe at the recommended intake. In cases of over dosage seek medical help. A comprehensive multi formula providing nutrients relevant for healthy hair. A nutri-suppliment for those who would like to optimise the health and appearance of their hair. Healthy hair is an outward sign of health and this product provides 25 essential micro-nutrients to help you stay in optimum health. It contains a good spread of nutrients including the B vitamins and biotin which can help in the maintenance of healthy skin, hair and nails. Due to modern diets the minerals and vitamins found in Maxi-Hair are not always consumed in their daily requirements. The nutrients in Maxi-Hair® are all presented at significant levels and so this product can be used as a complete multi, and should replace any other multi that is being taken. In fact the level of B vitamins and magnesium in Maxi-Hair® exceed the amounts found in typical high street multis, and vitamin D is presented at twice the level of most A-Z products. This unique formula is probably the most comprehensive supplement for Hair, Skin and Nails available. · The full 200mg of naturally derived silica from bamboo gum as it contains 75% organic silica and is one of the richest and most bioavailable forms. · MSM (Methylsulphonylmethane), a natural sulphur containing compound, has been included as it is an essential nutrient required for the body’s production of proteins, many of which are found in hair, skin and nails. · Biotin as it contributes to the maintenance of skin and hair. 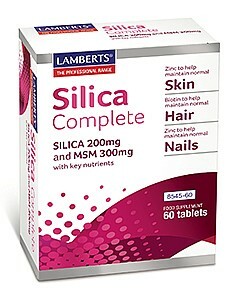 · Zinc as it contributes to the normal maintenance of skin, hair & nails. · Vitamin C as it contributes to maintenance of collagen production. 1tablet daily can be beneficial taken in conjunction with Florisene® .